A few weeks ago, the Fresh Face of the Democratic Party, Rep. Alexandria Ocasio-Cortez, D-N.Y., gave one of the great defenses in the history of politics. 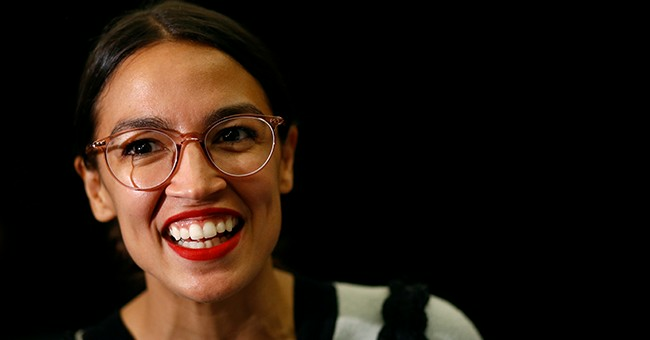 Accused of fibbing and twisting facts to meet her radical agenda, Ocasio-Cortez explained, "I think that there's a lot of people more concerned about being precisely, factually and semantically correct than about being morally right." Her statement was widely derided. But it is indeed the mantra of today's politics. The narrative must be preserved at all costs -- even the cost of the truth. Take, for example, Ocasio-Cortez's ridiculous statements this week on the state of modern America. She explained that her plan to radically restructure the American economy is necessitated by the fact that "the world is gonna end in 12 years if we don't address climate change." She added: "And your biggest issue is how are we gonna pay for it? And like, this is the war -- this is our World War II." Now, put aside her Nostradamus-like assertion regarding the incoming apocalypse. The important part followed: "How are we saying, 'Take it easy,' when the America that we're living in today is so dystopian with people sleeping in their cars so they can work a second job without health care and we're told to settle down." Now, when President Trump describes America as a dystopia rife with crime and suffering, the media point out that America is hardly a hellhole -- we're the most prosperous country in the history of the world. But when the charming AOC uses her false depiction of America to press for higher marginal tax rates, we're supposed to buy her story. This gap between the facts and the narrative dominates our politics. Here's how the narrative chain works: Somebody makes a fact-free accusation of X, which supports the more general narrative, Y, supported by the political left or right. Opponents debunk X. That attempt to debunk X is taken as evidence that opponents don't take the problem of Y seriously enough. Facts are marshaled to show that Y is true, even if X isn't. In a peculiar way, the lack of facts to back X lends passion to those who defend Y -- it allows them to malign the motives of those who don't defend Y. Let's take an example. The students of Covington Catholic High School are accused of mobbing and mocking a Native American veteran. This incident supports the broader narrative that Trump supporters, religious Americans and young white men are emissaries of racism and toxic masculinity. Then it turns out that the video has been taken wildly out of context and deliberately misinterpreted. Many advocates of the narrative immediately declare that while this incident is a poor example, the overall narrative is true -- and that leaping to conclusions will be justified next time, in order to prove that the overall narrative ought to be taken seriously. The only price: whomever is next maligned without facts. This pattern will continue to dominate our politics so long as we ascribe malign motives to those who wait for the facts to emerge -- and so long as we reward those who jump to conclusions in taking Y seriously. Waiting must become the order of the day. If it doesn't, politics is going to get a lot worse, and quickly.